The Sindacato Nazionale dei Giornalisti Cinematografici Italiani (Association of Italian Film Critics) announced the nominations for their 65th Nastro d'Argento (Silver Ribbon) Awards. 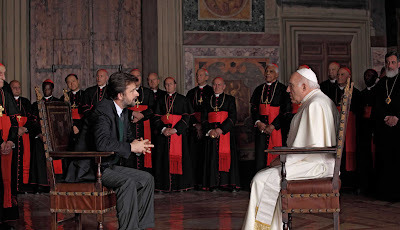 Leading with seven nominations was the recent Cannes competitor Habemus Papam (We have a Pope) by Nanni Moretti. It received nominations for Best Director, Producer, Story, Cinematography, Editing, Art Direction and Costume Design. Two films followed closely with six nominations. Benvenuti al Sud (Welcome to the South) received nominations for Best Comedy, Producer, Actress, Actor, Supporting Actress and Screenplay, while Nessuno mi può giudicare (Nobody Can Judge Me) picked up nominations for Best New Director, Comedy, Actress, Actor, Supporting Actress and Screenplay. Earlier this month at the 55th David di Donatello Awards, Paola Cortellesi won Best Actress for Nessuno mi può giudicare (Nobody Can Judge Me), while Valentina Lodovini of Benvenuti al Sud (Welcome to the South) won Best Supporting Actress. La Solitudine dei Numeri Primi (The Solitude of Prime Numbers) picked up five nominations. A number of films nabbed four: Malavoglia (The House by the Medlar Tree), Una vita tranquilla (A Quiet Life), Vallanzasca - Gli angeli del male (Angels of Evil), 20 sigarette (20 Cigarettes), Immaturi (The Immature) and La banda dei Babbi Natale (The Santa Claus Gang). The last two titles are comedies by Paolo Genovese. The awards ceremony for the 65th edition of the Nastro d'Argento Awards will be held on June 25, 2011 at the Teatro antico di Taormina. Special Mention "Nastro alla Titanus"